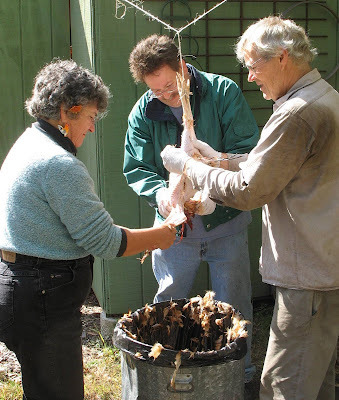 Learn about raising chickens for eggs and meat in your backyard and in a cooperative at a free information night on Sunday, March 7, 6-7:30 pm, at First Church Unitarian, 19 Foster St., Littleton. An optional potluck meal will be offered at 5 pm (no signup necessary). Childcare available if requested in advance. I'll be moderating a panel of five chicken keepers -- Brad Bigelow of Littleton, Denali Delmar of Westford, Alison Kaiser of Littleton, Margaret Miley of Acton -- about how to get started keeping chickens alone or in a co-operative. 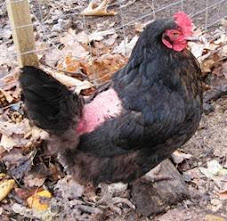 Learn about chicken shelters, yields, breeds, disease prevention, predators, equipment, vacation care, butchering (it’s not that hard), predators and more. Notice I didn't call us "experts" :-) I know enough to feed them, keep them alive and gather eggs. I even participated in the butchering at right. People will be invited to join a community egg co-operative in Littleton to share the work and benefits of raising backyard chickens together, and to join a meat co-operative to raise chickens for meat. Joining a chicken co-op is fun, shares the workload and offers the opportunity for people to learn from each other. Raising backyard chickens is gaining in popularity across America with the local foods movement. The typical food has been transported 1,500 miles. Eggs from backyard chickens travel a few feet from coop to table and are incredibly delicious, fresh and satisfying to raise and eat. Raising chickens will lower your carbon footprint and make new friends in the community. This free workshop will provide information and confidence to get started raising backyard eggs and meat on your own and to join a meat and egg co-operative. 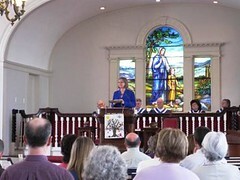 The workshop is sponsored by the Green Sanctuary Task Force of First Church Unitarian. Children welcome. Please RSVP if you need free childcare. Come for the potluck before or just the meeting. The public is invited. You do not have to attend the meeting to join a co-op. No registration required for attendance. If you're bringing something for the potluck, just bring it! For more information contact Susan Tordella, 978-772-3930, susan.tordella@gmail.com or call the church at 978-486-3044.